http://www.blogtalkradio.com/letsasktheangels/2013/10/12/creating-your-life-with-divine-guidancegoddesses To listen or download the complete show. 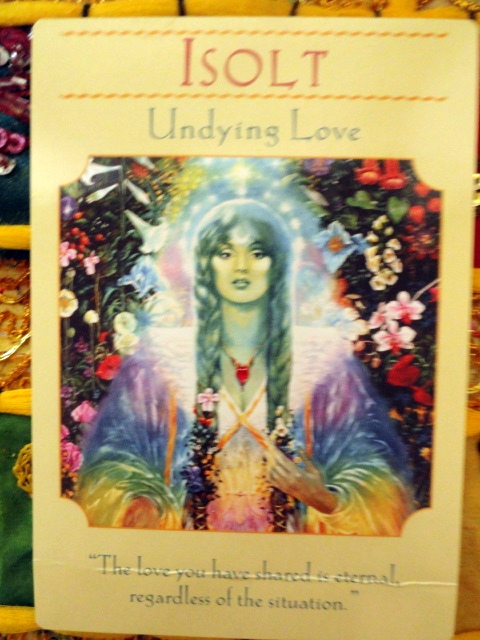 This week I was guided to use the Goddesses Guidance Oracle Cards Deck by Doreen Virtue. 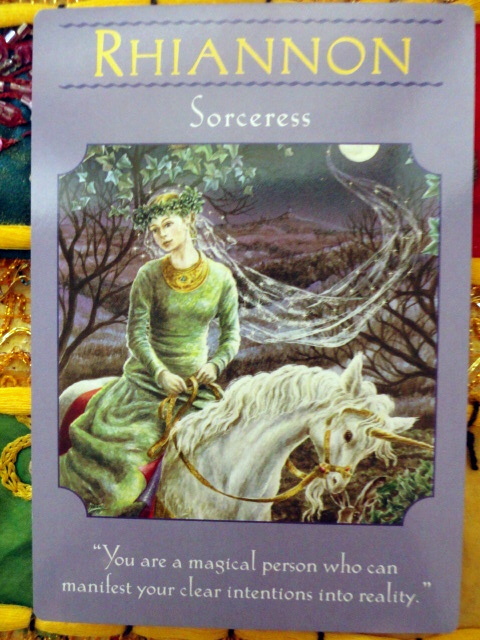 For the beginning of the week we have RHIANNON ( Welsh goddess) The message is SORCERESS: You are a magical person who can manifest your clear intentions into reality. The message here is to remind you that you are indeed a very magical person who has powers that you may not always be using to your best advantage. You can turn your clear thoughts and intentions of what desire into reality. The message is to take full responsibility of how powerful you are. Watch your thoughts and speaking carefully as you will see how your choices have dictated created situations and circumstances around you. Don’t like what you see shift and change your thoughts! Instead of spending time and thoughts on what you don’t like, observe and accept without judgement and then make another choice. Spend time in light and love and by doing that by the very nature of law of attraction that will attract more light and love. Clearing yourself daily of others negativity and fear you may have absorbed. Spending time in nature can also assist in detoxifying and releasing. Being in touch with the moon cycles can make a difference too. Rhiannon may come to us in the form of an animal, bird or song. Call upon her for help with manifestation, spirit communication, transitions or artistic inspiration. For the middle part of next week we have ISOLT (Celtic goddess). The message is UNDYING LOVE: The love you have shared is eternal, regardless of the situation. Isolt is saying that there is perfect love between anyone and everyone you have ever been with. Underlying all situations and occurrences there is an underlying pure connection. Isolt here is in a garden of beautiful flowers and also appears as spirit with rainbow colors merging into white light, all chakras all forms of energy. She is connected both to the spirit world and earth. In addressing issues with our parents here it speaks that regardless of how we were brought up and what was done or said the love you shared is eternal. The power of love is eternal. We can draw on that power in our lives today. Love by our own definition may definitely not look like what you or I had hoped, imagined or expected but it is the way it was. People are each on their own path and doing the best they can at each and every moment. There is power in acknowledging or being present with how you perceive love right now. To be able to be present to eternal love, energy, love, and not allaying any blame, judgment or criticism is a practice. It is getting to the place of perfect acceptance and compassion with all people. You can do this! With Isolt she will guide you in ways and actions you may not normally take. This message is about reclaiming your power to love and be loved by taking full responsibility of all your connections. You are an all powerful being who has infinite capacity to love and be loved. At this time you will have the ability to heal any connections to love where you felt hurt, disappointment or betrayal. It is a time to let go and let love and healing from a loss. For the end of the week and weekend we have, HATHOR (Egyptian goddess). 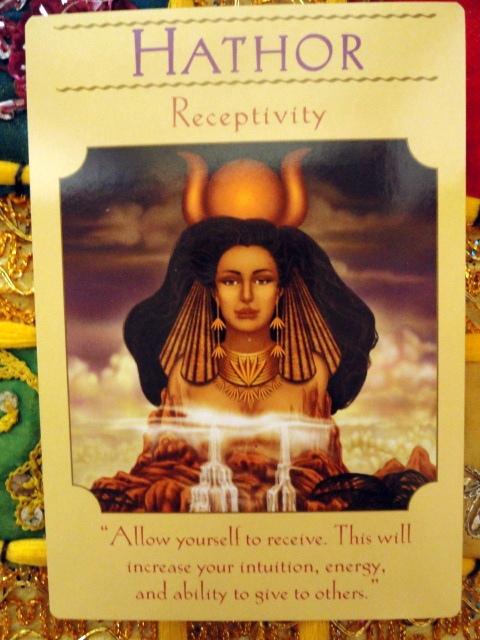 The message is RECEPTIVITY: Allow yourself to receive. This will increase your intuition, energy, and ability to give to others. Here the message is about being open to receiving. Hathor is saying open yourself up more to receive. This ties in perfectly with the last card. By opening and allowing, we can receive the universe’s gifts of energies that are before us in many ways. We allow this connection to source us that it can flow to us and through us. Hathor can assist us . This may be in the form of receiving divine guidance from your guides, nature, angels and more. This message also is about being present, witnessing and observing more powerfully what is going on around us. What messages are we receiving daily that we are ignoring or unconscious to because they do not fit our usual expected ways to receive. This is also about acknowledging we can sometimes be uncomfortable about receiving because the ego or we want to stay in control. Hathor is saying to be open and vulnerable and allow ourselves to know we are magnificent beings of divine perfection and totally deserving of all of God’s graces. By affirming more often,’ I allow myself to receive’ can make a huge difference. Today give up all ideas about how receiving looks like. Give up being in control of how much and from who you will only receive. Be totally open to miracles as Gabrielle Bernstein says in her book, “May Cause Miracles.” The message says you will be more open to receiving at this time. Healing is occurring and you are in a learning state. All three of these Goddesses are depicted on the cards as being between Heaven and Earth. A clear message that they are here to assist us if we let them.